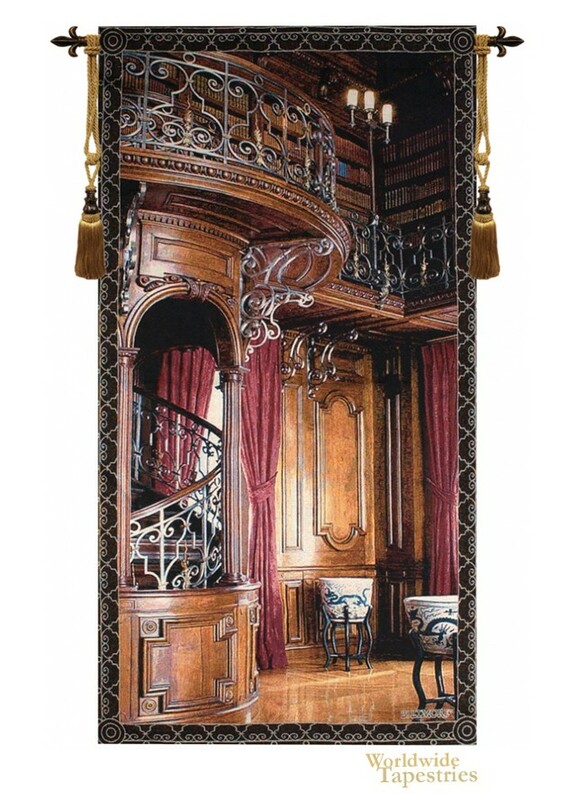 This Library tapestry shows a grand library stairway resembling a grand house. The wooden paneling is grand and opulent in this library, with the books residing on the upstairs. The work is from the Baltimore Estate, and shows the play of light on the scene. The staircase and balcony is a work of art with its fine details. Crimson curtains as well as white and blue vases decorate the room, and adds more elegance to the scene. This Library tapestry is backed with lining and tunnel for easy hanging. Note: tapestry rod and tassels, where pictured, are purchased separately. Dimensions: W 35" x H 63"